Maybe. 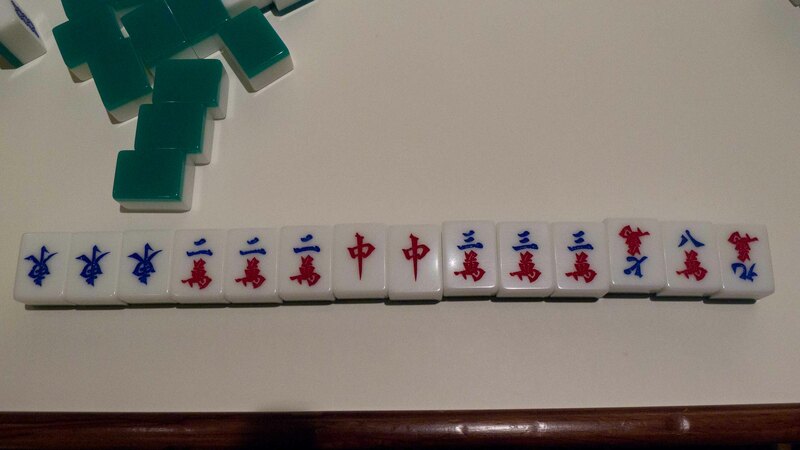 I had my first mahjong lesson yesterday. In China this is probably closer to the opium of the masses than religion. 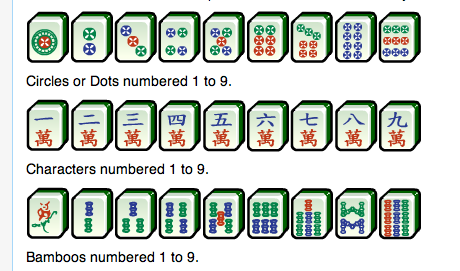 As I discovered doing a little pre-reading there are many varieties of mahjong. I was learning the Guangdong-style. It seems that whichever style you play all others are decidedly infra dig. My challenge is that the tiles have no western numbers added so when I look at the tiles, particularly the numbers, I first have to run my mental HP12C over them to work out exactly what I have. It is not yet fully embedded. This is sourced from Wikipedia and as you can see even a bear of very little brain can do the circles and bamboos and with a single digit IQ you can stretch to 1,2,3. 4, 7 and 8 I recognize so that leaves my brain in third gear running through 5, 6 and 9. Pardon me while I double-declutch. Mahjong is fast so this is ‘bad form’ in the sense that I am needlessly holding up the game. Now here is another glitch. None of the players knew what I meant by dragons, despite the fact that my pre-reading invariably referred to them as such. No. They are: hung jong, bak ban and fat choi. More Chinese to learn. And the winds…. 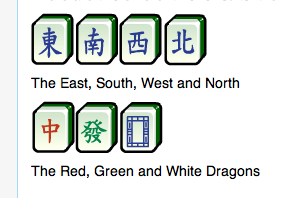 Westerners start at North and progress South, East West or if going round the compass, N, E, S, W. China is in the East so they think of winds in the sequence East, South, West, North or dung, nam, sai, bak. And many of these words have a glottal stop at the end so ‘bak’ sounds like ‘ba’ with the ‘k’ being swallowed. Are you still with me? Anyway, the challenge for me is to recognize the characters as they don’t have NSEW on the tiles as some sets have, designed I presume for export to the American market. You will note, if even moderately observant, that not all the tiles are the right way up. Hey! I’m Welsh. What do you expect? I was thrilled. The adrenalin was jetting through me. They say that if a golf beginner ever lets rip with a driver and it sails imperially down the middle of the fairway he will be hooked for life. That was how my win felt. Well, perhaps a little more like smugness. I didn’t shout ‘fore’ for a start. And there was no tee cartwheeling backwards. My fellow players paid up in bewilderment – some yellow plastic chips and a few red ones I think. No matchsticks. And what occasion brought me to this rite of passage. A Chinese wedding banquet of course. Two hours mahjong before the ceremony, and an hour between the ceremony and the reception. And so, to satisfy my followers’ lust for photographs, I give you the Bride and Groom. May all their troubles be little ones. Well yes, it is a biscuit tin. A fairly old one. Probably from the 60s. But it is a lot more. Shall we open it? 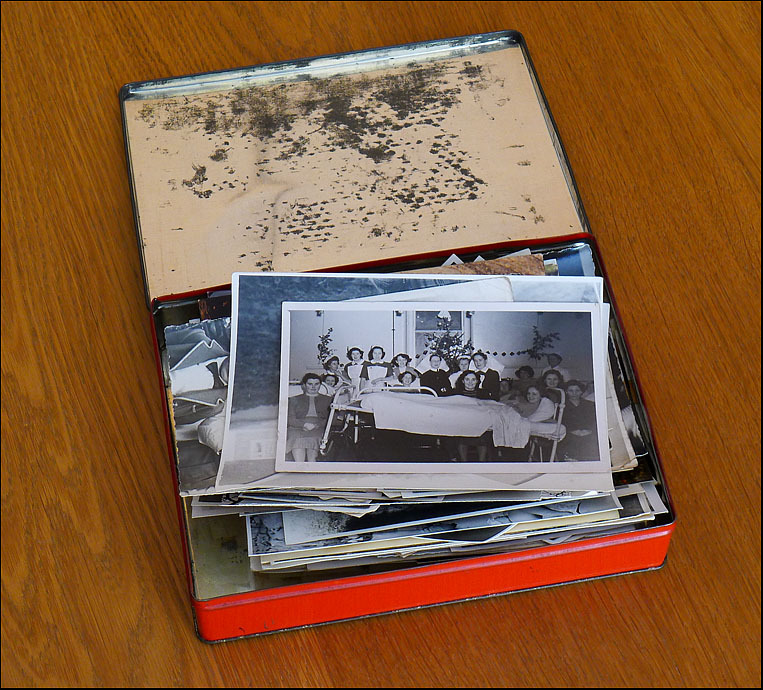 You see…… it is a treasure chest, full of photographs. Some I recognize. Many I don’t. The top one is from 1951. 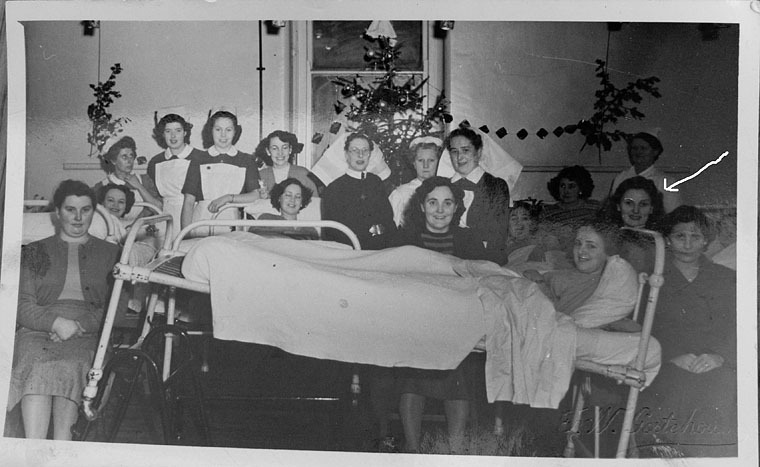 I know that because my mother is in it and she is in a hospital ward. She had TB and spent 6 months in hospital that year. It also Christmas time and they all look cheery. 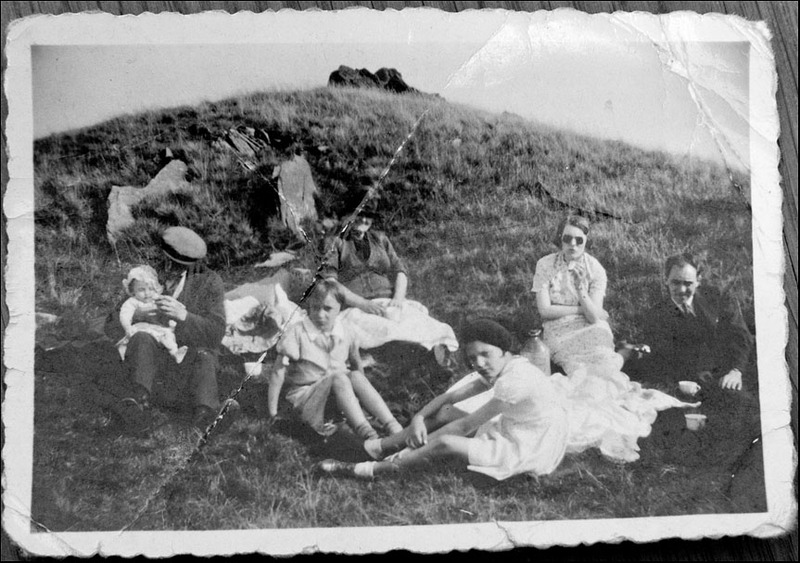 I have not scanned these images – I just photographed them (sort of flatish) on the floor so excuse the quality. But the nurses uniforms! Carry on Matron! I have marked my mother – she seems to be well on the way to recovery by this stage. Just think, this was only a few years after the end of the war. I imagine rationing is still in place and times must have been very hard. Now this one fascinates me. The picture is in poor condition. I don’t know where it was taken. Possibly the mountain behind Llanbradach? Who are they? Why did my parents have a copy? It could be a Cartier Bresson. The matriarch and her entourage looking at the camera but the patriarch too absorbed in his grandchild. I love the flat cap – would this be the 30s? A nice hillside with a rocky outcrop on top. A blanket for mam to sit on. Are they related to me? I have no idea. No what about this. I am just about old enough to remember the era when the houses in Garden Street had outside toilets at the end of the garden, no proper bathrooms – a tin bath in front of the fire instead – and washing machines were a luxury. 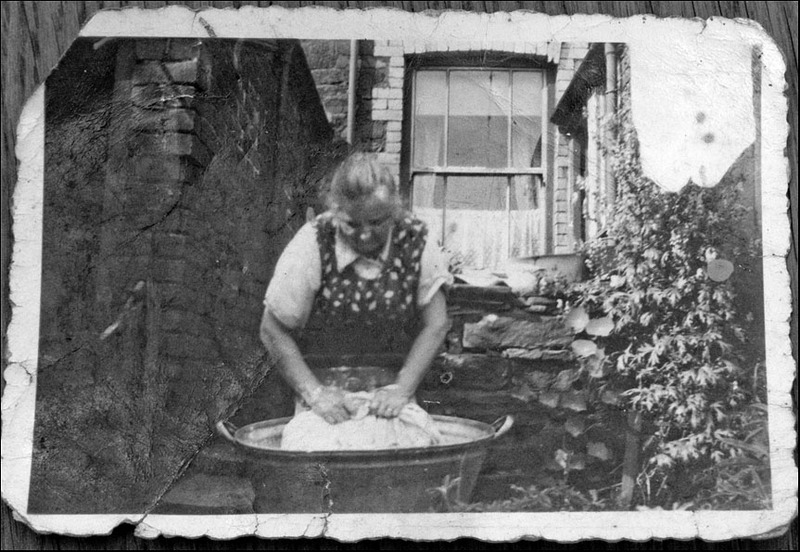 I don’t know who this is but she is working hard – washing the clothes or linen in a tin bath. By hand. Yes you youngsters, by hand. Outside too. Maybe this was in Garden Street. The slate walls look right. So does the brickwork on the house behind. Long terraces of miners’ houses. Look at the strength in the arms of the woman – her pinny neat and smart. Not looking at the camera. Too busy. Who took the photo and why? Intriguing. One last one for today. This handsome, debonair, Basil Rathbone lookalike(??) 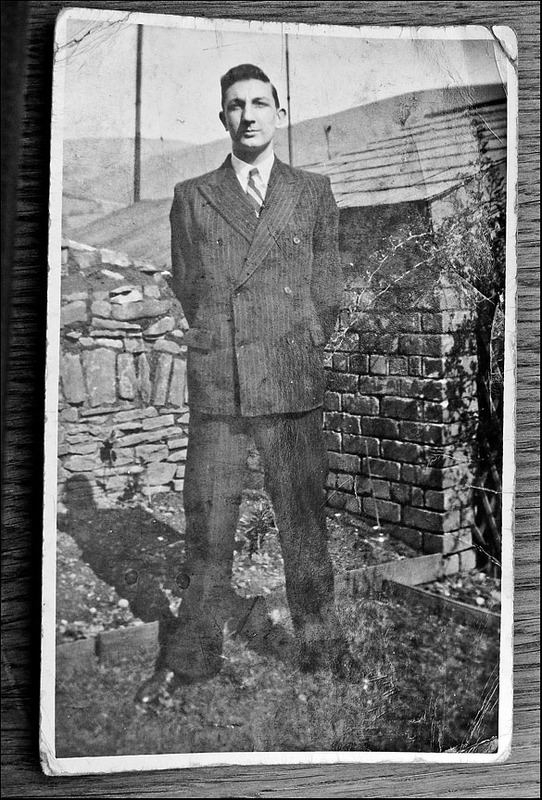 is my dear old late dad. He told me once, if I recall correctly, that this was his demob suit. The suit given to you when you were demobilized from the forces after the war. He was in the Royal Navy on the subs. I went round an old sub at Gosport once and he was with me. He was 6′ tall, I somewhat more, and the headroom was about 5′. So he must have spent most of his service time hunched over. I am sure this was taken in the back garden of 54 Garden Street. The building behind him is that very loo at the end of the garden. I guess that’s why they could all sing in those days. You sang to let people know it was occupied. Nowadays you’d probably hear the whining of a space invaders game on a play station thingy. So, history come alive. 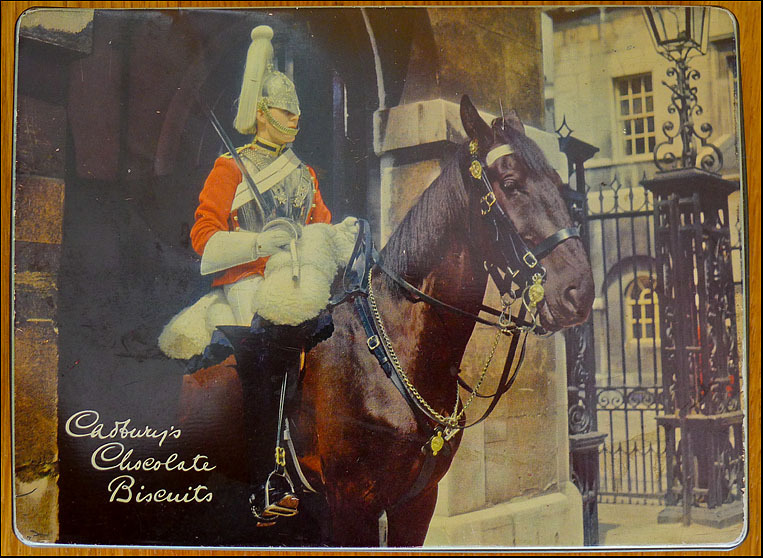 And next time someone passes you the biscuit tin, have a look inside. It may not be a chocolate finger. Bore da! A seemingly very contented baby, fascinated by my camera. Her dad was aware I was taking this shot. I converted this to B&W in Silver Efex Pro 2.